What is a Bold-Faced Hornet? The Bald-Faced Hornet gets it’s name from their black and white coloring, as well as their large size. 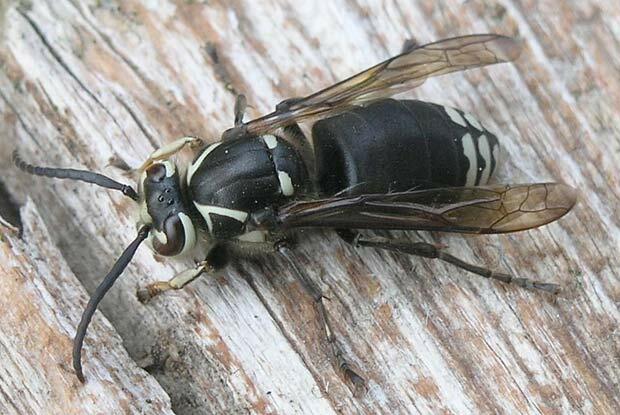 The bald-faced hornet is not a true hornet. It is actually part of the yellow jacket & wasp family. They are found throughout North America and known to be extremely aggressive, stinging repeatedly if disturbed. Adult workers range from 5/8 – 3/4″ long and queens measure 3/4″ or longer. They’re known for they’re large oval, paper nests, reaching sizes of up to 14″ in diameter and over 24″ in length. Nests are usually found in vegetation, varying from shrubs and ground level vines to tree branches up to 66ft high. Like the yellow jacket, the bald-faced hornet queen will not reuse an old nest. Every year the queens start a new colony and raise their young, growing they’re nest through spring, summer and into fall. Bold-Faced Hornets, as well as most hornet species deliver a painful sting. They build their nests under eaves, underground, in attics, wall voids, and trees, and may swarm and attack if the nest is threatened. Some people are highly allergic but don’t know it until they are stung. Just recently there have been reports of abnormally strong allergic reactions to yellow jacket stings on the west coast. Place yellow jacket traps out in early spring (end of March through April). Many wasps captured during this time will be queens, preventing nests from becoming established. Later in the year traps can be placed along fences to capture foraging workers. Tightly close garbage cans and pick up downed fruit-both are strong attractants. Locating and treating wasp nests can be a delicate operation. There is a variety of equipment to safely eliminate the nest, and your specialist will work with you to formulate the best approach for your situation. Specialized training enables Portland Pest Guard to treat nests any time of day.